Featuring the Adorn Series of Furniture Power Solutions by LeGrand. The AD2-PUR-M is a standard unit, 15A duplex receptacle with USB charging port and a half paddle switch with a magnesium finish. These easy to install furniture power solutions have been beautifully designed to provide power that's built-in to furniture, providing power access points that were previously unavailable. Fueled by the beauty and diversity of adorne devices and wall plates, Furniture Power Centers are designed to blend seamlessly with or provide a beautiful accent to your furniture and design of your space. This unit comes standard with 8 foot cord with right angle plug. The Adorne Collection comes in a variety of available models. These are available in 1-, 2- and 3-gang options and can accommodate all the power, USB charging, switching and dimming you need for any space. Fast plug and play installation, simply install the unit in your furniture and plug it in. With a shallow steel housing of only 2-1/4" deep, they are ideally installed in tight spaces with limited room. Units with USB ports each provide 2.4A of USB Charging, which allows for quick charging of your phones and tablets. The Adorne collection offers wide range of of colors and finishes to virtually match any color scheme or decor. Unit Dimensions: Depth: 2.75", Height: 4.71", Width: 6.64"
Cut Out Dimensions: 4.20" x 4.45"
Are the adorne and radiant Furniture Power Centers safety listed? Do the adorne and radiant Furniture Power Centers meet ADA requirements? Yes, the switching and dimming elements of the adorne and radiant Furniture Power Centers meet section 309.4(f) of the 2010 ADA Standards for Accessible Design. Can I install one in furniture that is moved around? Yes, you can. Furniture Power Centers are cord and plug connected, so you can simply unplug it, move your furniture, then plug it back in. Can I install it in upholstered furniture? Yes. For radiant Furniture Power Centers, a maximum of ¼ in. (6.4mm) upholstery will work. For the adorne Furniture Power Centers, a maximum of 1/16 in. (1.6mm) is allowed. Can this be installed in bathroom case goods or where water could be present? 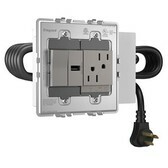 Yes, but you must plug the Furniture Power Center into a GFCI protected receptacle per the NEC. Why is the wall plate sold separately? We offer a wide variety of finishes for adorne wall plates. With the wall plate sold separately, you have more options for your Furniture Power Center to blend in seamlessly with furniture and room designs. 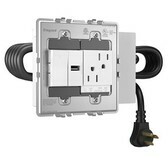 Do I have to use the wall plate on the adorne Furniture Power Center? No, you are free to use the outlets without the wall plate. If you do, just be sure it sits proud of the furniture a minimum of 1/32 in. (0.8mm). How does the switch control a light? The switch controls an outlet located on the back of the Furniture Power Center. This powers your lamp, but the lamp you use must have a cord and plug to work with a Furniture Power Center.